Last week hubby went away to a wedding alone. He left before the sun was up Wednesday morning and was due back in town Saturday at about noon. Thank goodness for my parents. The boys and I stayed with them Tuesday night to Saturday and enjoyed our extra time with Nana and Papa. Having extra hands on deck to assist me, and especially to go trick-or-treating was beyond a blessing. It was also pretty nice sleeping in my old room and looking at some of my things while the little guy bunked in with me. NHL knew where Daddy was going and understood that he would be back by the weekend. Since he is in kindergarten he was able to count down the days before JL returned. Of course he did have some trouble expressing how he missed Daddy. Although he was very good while at my parent’s house, he was a little challenging at school on Wednesday and Thursday. Of course many of the other children were as well, so perhaps Halloween was a large factor with NHL. Poor JSL did not understand what was going on. Daddy just disappeared and he never uttered "Dada" all Wednesday morning or afternoon until we called JL to chat with him. My goodness the little guy’s face lit up as he chanted and clapped his hands. This was repeated many more times over the days JL was away. Still each night he looked sad and settled in to sleep in my old room. He was supposed to sleep in a Pack N’ Play in the room with NHL, but he was so restless he kept hitting into the side and waking up. When Saturday morning arrived NHL was so excited. He knew that Daddy was already on an airplane coming home. JSL did not have a clue. I think he was too skeptical to believe anything we had to say. As we drove to the airport I realized something. Neither of the boys had ever been there in the daylight to see planes landing. 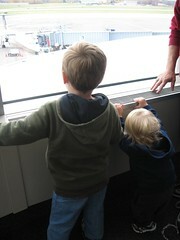 We went up to the observation deck to show the kids the runway. 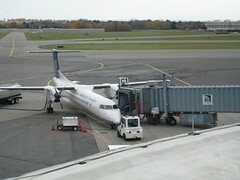 NHL was amazed with the size of the planes on the ground. 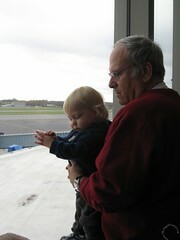 He was able to see several small airplanes take off and land. Eventually he saw JL’s plane land and taxi into the terminal. Sadly, I did not take any photos of the reunion of my boys. It truly was priceless. Had security not been there I think the boys would have run to Daddy. Neither of them wanted to let go of JL. For the rest of the day they were quite attached to him, especially the little one who seemed afraid of Daddy leaving again. I know that I am also glad to have my husband and best friend back home as well! Glad he made it back home safe! Nice airport pics. I bet it was a cool experience watching the planes for the boys. Looks like after all this…maybe YOU’LL get to take a bit of a vacation YOURSELF sometime soon! Atleast that’s what I’D be pushing for! One good turn deserves another! I’ll bet their greeting made him feel fantastic. It’s so nice to be together again when you’ve been apart. Ooooh, that is so cute! How wonderful that the boys have bonded so closely to Dad they missed him so much. Of course, you missed him too. I’m sure your husband feels like the King of the World now.